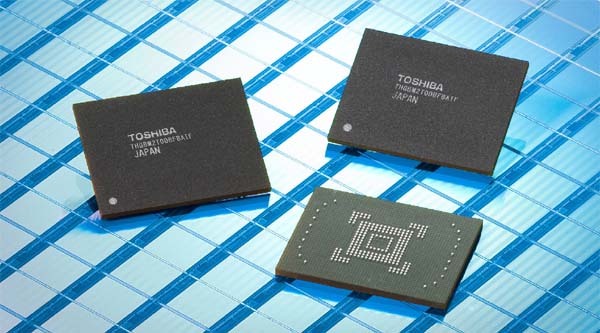 Expect your smartphone, digital camera or tablet computer to get a big spec bump in the near future: Toshiba today announced it has developed the world’s first embedded NAND flash memory module with 128GB capacity. That’s enough to store 2,222 hours of music (at 128Kbps), 16.6 hours of full HD video, or 38.4 hours of SD video. Made by combining 16 64Gbit NAND chips, the new devices are sized at just 17×22×1.4mm (including a controller). The new module is compatible with the so-called e-MMC standard (embedded MultiMediaCard), as is a 64GB NAND module Toshiba announced along with the 128GB model. The company plans to ship the first samples of the 128GB module in September (the 64GB samples will get shipped in August), followed by mass production of both versions in the fourth quarter of this year.